Well here we are again. Another year in the books. When I think about life now it’s almost everything before the boys entered into our world and everything since. Recently, I went to dinner with several of my college besties and we started talking about college days (which feels like a lifetime ago) and memories were dredged up from a corner of my brain I didn’t realize was there. I also realized without those valuable and long lasting friendships, memories that would probably have been forgotten. Life is a funny thing. It makes me think about individuals like my grandparents that are 92/93 years young, who survived immigration, famine, wars and raising ELEVEN children. Can you even imagine the number of life’s moments that are tucked away in their memories? I feel lucky that in this day and age the ability to take pictures and videos is literally in my pocket at all times. I’m also so curious to see what develops in the next 30 years. Flying cars? 2018 has been an eventful year and that has been partially contributed to returning to the workforce full time. Its afforded us things we have talked and dreamt about for a while now. We bought a travel trailer. Technically, that was at the very end of 2017 but this past year is when we began to really use it. We’ve taken it to a few near by state parks in TX and OK. We even tested out the ability to camp with others, all squished into just our camper. We have definitely used it as a “guest house” when we go visit Kemp and my brother’s family stayed in it when the house overflowed during the boys’ birthday celebrations. In true cousin Eddy style, we actually plan to take it as our home away from home for the out of town holiday festivities this year! She’s a beaut Clark! In January, our family grew! My younger brother and his wife had a baby! He is such a chunky monkey and watching him (via photos) grow this year is the best. Early this year we also went to Monster Jam (total disaster), took a spring break staycation in Fort Worth and Josh completed his RCIA journey. Josh and I also took our first adult only vacation away from the boys to Puerto Adventures in March. I felt a bit of guilt but my parents were here to love on them and I also really tried to prioritize my marriage. I am fully and completely obsessed with my children but before them I was equally as obsessed with The Hubs. I don’t think I am any less obsessed but our attention to each other is obviously split now. So we spent an entire 5 days solely focused on each other. It was awesome. There were somethings about the resort and the location I wasn’t super pleased with but overall, it was a much needed time together. I wrote a post about what we did mostly this summer and how Corbin’s surgery recovery actually took a large chunk of time but we did have lots of fun too! Corbin and Weston fine tuned their swimming skills, lots of backyard fun, went on several camp trips and plenty of gatherings with friends. We also finally made our first trip to Destin, FL and I’m quite sure we’re never going to any other beach. SO beautiful and now we know why Texans flock there in the summer time. The AirBnB we stayed in was THE perfect location and the trip was just relaxing and enjoyable. We also have a list of things we plan to do next year! The fall always means lots of birthday celebrations and parties for our crew. 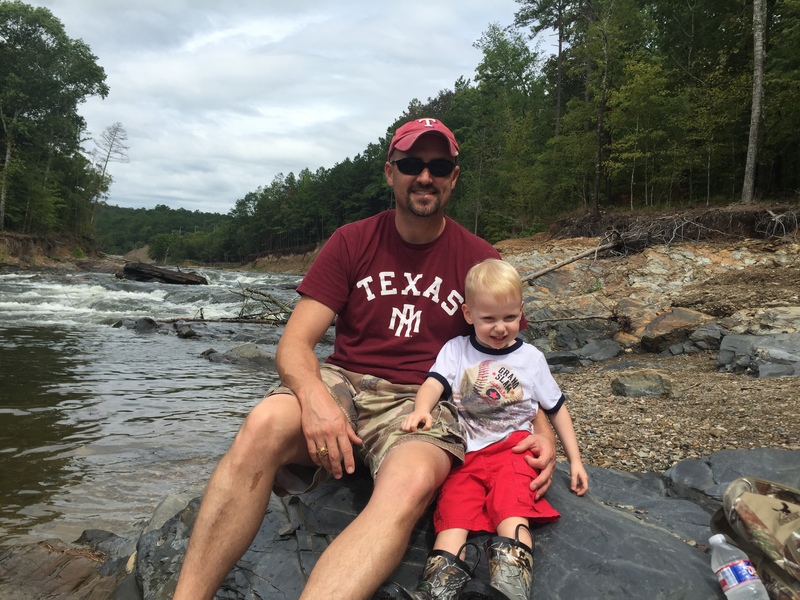 We took a trip to Broken Bow and had blast with a big group of friends and followed closely by the holidays. Thanksgiving blends right into Christmas and here we are…the year’s end. It’s not over yet! In the homestretch of the year, we decided to do some much needed renovations on the outside of our home. We’ve been slowly updating and beautifying the inside but the outside was looking rough. Painters are working as we speak! I’m terrified I didn’t pick the right colors (happens to me every time) but once everything is all said and done….I’ll post pictures of the finished product. Christmas is next week (eek!) and I feel pretty ready. I’ve been thoroughly enjoying all the get togethers and Christmas cheer. We are headed south and I’m excited to get to snuggle nieces and nephews, eat and drink too much and enjoy the merriment. My babies are not babies anymore. They’re little boys. They’ve obviously been headed in this direction for some time now and many might argue they haven’t been babies in a long while. But before I could still scoop them up, squeeze em and love all over them. I could still hold them in my arms. They both gave kisses willingly and snuggles were never enough. Mommy could always “fix” the problem. Both always looked to me (or The Hubs) for guidance and assurance. Now they’re just so darn independent. An opinionated. And goofy. They still love me. Its just differently. I know it will change again as they continue to get older, more mature, and “grown up”. I also realize these are signs that we are doing something right. Asserting their ability to do things on their own, make their own decisions and learn from it. It still means they need me less and that’s a hard pill to swallow. Corbin is 42′ tall and (has thankfully gained a few pounds since the tonsillectomy) weighs in at 36.4 lbs. He still has his stunning blue eyes and sweet smirk. Corbin still wakes up first, and entirely too early, but gives the reason that he needs to snuggle. Sometimes it means he gets up more than once during the night. He has agreed to “give up” sucking his thumb now that he is a big 5 year old but still loves his blankie fiercely. He has a very outgoing personality and is always pretending he is something or somewhere but he has to get permission first – Mommy, can I pretend I am ________? Corbin is not shy. He will let you know how he feels, who pushed/stepped on his foot/didn’t play with him, who he doesn’t like, all usually within earshot of the other kid’s mom at after school pickup. Sheesh. I try to embrace it. Kids are honest and Corbin is going to deliver you the truth. Since starting at a montessori school Corbin has drifted towards math and enjoys those lessons. Montessori schools use a lot of hands on objects to learn (i.e. counting beads, stacking blocks) and that is right up his alley. Corbin is the pickiest eater. He will like something one day and not the next, he love all typical kid food but he does like more meat options then average. The only veggie that gets past his lips are corn and carrots – occasionally. Since day one, Weston has always been just a hair bigger than his brother. Weston weighs in at 38 lbs and is 43.5″ tall. Occasionally, I think my boys are tall (both are greater than the 75%) but then I see them next to a really tall kid! Weston has the biggest smile and loves to laugh at Corbin (who loves to make him laugh). Weston has a mixed personality. He can be very bossy and assertive at home but in social setting, he really needs Corbin to give him confidence. We were camping a few months back and he was desperate to go play with the kids across the campground but would not go without Corbin. Once he feels Corbin’s support and gets the courage up to go introduce himself, he’s off. Sometimes to Corbin’s displeasure because he gets left behind. Weston likes to please us more than not, especially when I’m on my last bit of patience. Or when Corbin has made me cry (true story). Weston is a pretty good eater but is not a fan of most meat choices. He will eat an occasional meatball or piece of lunch meat and much prefers carbs (like his momma). Weston will still come to to mommy to “fix it”, whatever it is and I hope that doesn’t stop too soon. Corbin and Weston filled our lives in a way I never knew they could. The Hubs and I both badly wanted kids but there really is no way to understand how fulfilling children make life until you have them (whether it’s the old fashioned way or adoption or even gaining kids through a marriage). It’s not always easy but the hard times are totally worth it. We are an infertility “success” story. What’s compelling is we were never really diagnosed with anything to make us infertile so it was an “unexplained infertility” which was heart wrenching. It’s easy for me to look back and say, God planned it this way. It was impossibly difficult to endure but it did work out perfect, according to His plan. HAPPY BIRTHDAY WESTON AND CORBIN! I had big plans for our summer and it is already August(!!!!) and I don’t feel like I’ve check off any items on the wish list. Granted, some of our (outdoor) plans were postponed due to 21 days of 100º+ days! It’s been a HOT June/July for summer 2018. What has occupied us lately: It’s been eight days since Corbin had a tonsillectomy and adenoidectomy. It is every bit as brutal as you hear about. My little guy is a tough kid. This surgery has taken a toll on his body and spirit. We told Corbin he was having his tonsils “fixed”. They were blocking 75% of his throat. He was rated a 4 out of a 4 rating for enlarged tonsils. He wasn’t eating well at all, he stopped liking foods he has always liked and his obstructed sleep apnea was shocking. We knew he snored (like a grown man!) but I finally witnessed how severe his OSA was one morning. My poor boy lay there with his chest rapidly rising and falling but no air was going in until eventually he gasped and rolled over. That is how my child was sleeping. No wonder he was tired all of the time. I think even he was ready. We told Cor he would go to sleep at the doctor’s and would wake up with a sore throat. Obviously, we couldn’t tell him he would be in severe pain but even The Hubs and I were not prepared for how rough the recovery would be. Corbin just knew he was going to get his throat “fixed” and be able to eat allll the ice cream. Surgery day he was prepared. They wheeled him back and away he went, no tears. He was probably gone 35-45 minute and they called us to recovery. I had been warned that he might wake up from anesthesia angry and so we were “ready”. We did not experience anger or confusion, Corbin just rolled around A LOT and itched/rubbed his face (tangled himself in every cord) but slowly, he came around. Again NO tears. After about an hour and a popsicle, we were headed home. He took a short cat nap on the car ride home but for the rest of the day Corbin watched movies and ate ice cream. Overall he seemed really good. Days 1-4 post op weren’t good but they weren’t bad. He was prescribed hydrocodone/acetaminophen combo and was supposed to take it every 5-6 hours. Corbin was barely making it to five hours without being in quite a bit of pain and started to really resist the medications around day four/five. Since he didn’t want to take the pain medications, he said they were “spicy”, Corbin started to really slow down on eating or drinking. By the evening of day seven, he was refusing everything. I slept with him that evening and he tossed and turned until we we woke him up in the middle of the night to give him a dose and about an hour later, he vomited. His stomach was very irritated due to the pain meds and no food. He continued to toss and turn all night. The following morning, Corbin still refused anything to eat, drink and his pain meds and he hadn’t gone to the restroom in almost 24 hours. He wouldn’t talk to me, he would hold his ears and cry. After multiple calls to his surgeon, we decided to go to the ER. He received pain meds, nausea meds, and two bags of fluids. And two popsicles. As an example as to how tough Corbin really is, he didn’t flinch or cry when they put the IV in his hand. The extra nurse that was there to hold him down assist, even commented that he did amazing. Yet this recovery has literally brought him to his knees crying. After his ER treatment, Corbin really perked up. When we got home he was asking for more to eat and consumed two large servings of chicken noodle soup! What a bummer. The doctor told us it would be a rough two weeks but we were NOT prepared for this. Today is day nine post op and Corbin slept well last night. He woke up still holding his ears. NOTE: you’re wondering why his ears hurt so much when the surgery was in his throat….it’s referred pain. There is a nerve that runs through all of those areas, that are affected by the swelling. The ER doctor said, think about a scab and how, as it heals, it pulls on the skin in the surrounding area. OUCH. We are really hoping and praying that Corbin has turned the corner and is on the upside of recovery. Weston has acted out a little bit. I hoped he would be understanding and empathetic but he’s a four year old boy. Not so much. Weston has been going to school and field trip without his bro and doesn’t really like all the extra attention Corbin is getting. The Hubs and I keep trying to do one on one things with Weston but I think he is also ready for everything to go back to “normal”. June and July just zoomed by and we’re on the tail end of summer. (Although in the South, warm swimming weather sticks around until forever September.) We have a family/friend swim day on the calendar for next weekend, a camping/fishing trip with more friends in a few more weeks and counting down (44 days) until our B E A C H vacation to Destin! I wrote this post when it was still spring time. But in true Lindsey fashion, I’m posting it a month late. Spring was pretty “spring-ish” this year. In North Texas (which is drastically different then South Texas) we don’t really get four full seasons but this area gets sorta seasons. Mostly, we get a whole lotta HOT and a little bit of cold and a teeeeeny bit in-between. This year our spring was actually lovely. Minus the allergies. This year we bought a travel trailer. The Hubs and I have always loved (tent) camping and since we’ve had the boys…well lets just say I had zero desire to drag pack’n’plays and diapers into the mix. I used to complain, if we had a camper we could “camp” since it’s pretty much a house on wheels. Welp, The Hubs finally listened. We bought a 2013 travel trailer in December. Unfortunately, we find ourselves super busy (nothing new) and if we don’t prioritize camping trips, they don’t happen. We’ve used the trailer as a home away from home while visiting Gramma (my mother in law) and it was absolutely great! My goal for this summer is to camp at least once a month. If we cannot manage to use the camper, we don’t need to have it and pay insurance/storage. I wish we had a driveway where we could park it but we live on a hill, so even parking it in front of the house is sketch. We need to have a family meeting and put a “Summer To Do” wishlist together for the summer months ahead. I have lot of other things to blog about like the boys sleeping challenges (bad dreams, sleep apnea, our Mexico vaca) so I’ll be back. Soon, I promise. I’m a day month late but better then never. Easter 2018 was extra special. The Hubs went through the journey to become Catholic and joined the church on March 31, 2018. I am a “cradle Catholic” (baptized as a baby and raised) in the church. When I met The Hubs, he was not heavily involved in any church. He was raised in a more non-denominational Christian design and I worried that he and I would “fit” in the long run. To be completely honest, in my early twenties I wasn’t doing a great job with my faith journey either. But I knew what was important to me and Josh assured me through loving words and actions that we would make the long haul. God obviously knows what he is doing and here we are 13 years later. I cannot claim to be the reason The Hubs decided to become Catholic. He prayed for a sign and saw it while at mass one week. The Hubs tells me that he wouldn’t have been at mass if he wasn’t married to me, if we weren’t setting the example for the boys and I wasn’t dragging everyone out the door on Sunday mornings. I don’t think the source of the reason is necessarily important but while he’s gone through the RCIA journey, as his sponsor, my eyes have been opened and I have learned much more about my faith and grown in my religion. I believe the timing was just right and I’m so grateful for where we are now. Together. Forever. I’m am 100% confident I have another blog post titled “Hiatus’. But for real. I left this little slice of web alone for well over a year. I was feeling a bit of a struggle between documenting life and living life. I LOVE my mom blogs (absolute fav) and I felt a desire to have everything so well documented, something that I could reference until the inter-webs crash (…probably reading too many dystopia novels). Moving into 2018, I’ve decided I want to write again. When I can. I want to update and track and document and share. When I can. My family is number one and everything else comes after that. Well, God is numero uno actually but you get what I mean. He comes before all else. I went back to work. Gasp. And I LOVE it. Cough. Like really love it. Choke. If you know me, you know my background is HR. When we became a single family income, I tried think of all kinds of SAHM ideas to bring in extra money AND to give me something to do. I wanted to be a photographer (like Brittany). I wanted to own a small online shop of cute tees. I wanted to do alllll the things I saw other SAHMs creating and working and balancing a family. What ended up actually occurring was I realized those are all super HARD work also. I had zero knowledge of photography and although I learned a LOT online, I really needed hands on guidance. Editing also took up SO MUCH time. I would get faster the more I worked with it but watching You tube videos and reading tutorials, while working on a photo was time consuming. I also failed miserably at sewing. I tried but probably not nearly hard enough. I also really wanted hands on learning. I want to ask a question, “what did I do wrong here?” You Tube didn’t help much with that either. Afterwards, I learned that I was actually starting out with a pretty difficult fabric to work with for a beginner. That is my learning style though. I’m a very visual and interactive student. If I had more patience and time, maybe I could have excelled at both. Now that the boys are FOUR, maybe I’ll try again. Or maybe I’ll wait a little longer. In the meantime, an opportunity presented itself in my “corporate world”. It was going to be a 3 month contract position and my mom volunteered to live with us (eek!) and watch the boys while I tried this whole working-outside-the-home thing again. A few things lead me to take this opportunity. It was temporary. If I didn’t like it, I’d quit. 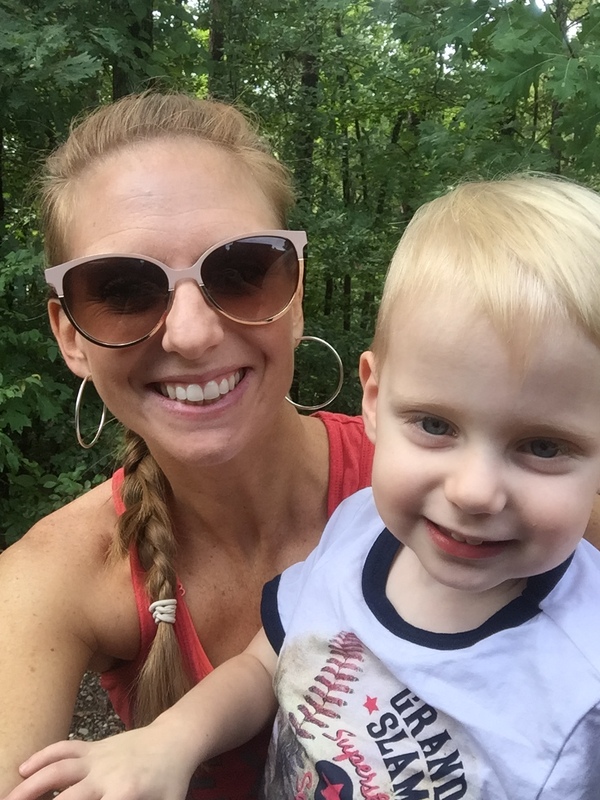 It was exactly what I was looking to do (in HR) before I had the opportunity to be a SAHM. It would be an easy transition for the Nugs because they’d be with their Momo. Their schedule and school days would stay the same and everything. I started in October 2017 and I’m actually waiting to hopefully be hired on full-time. That’s what they keep telling me at least. Its an outstanding locally headquartered company and my boss is the best part. She was a SAHM for almost 20 years and she has made the transition so great. I know my experience could have been much different so I’m very grateful. The Nuggets. They’ve have had a harder time transitioning. They most definitely do NOT like going to school every day. We put them in a Primrose school and they go from 7:30a-4/4:30p and even after two months it’s still a little challenging. Once they get to school it’s fine. Most of the time they do not want to go home when we pick them up. But the battles of getting out of bed, dressed and out the door are tough. It’s super tough on me because I feel like I’m making the wrong decision but let me tell you how it was before I went back to work. Corbin and Weston were SICK and tired of me. And to be honest, I was a bit worn out with them too. Maybe more then “just a bit”. Both boys were always SO excited to see Daddy when he came home from work and I was pretty much always chopped liver. I was constantly desperate to get out of the house and would dump the boys on the Hubs far too often because I needed a break. They went to school Tues/Thurs from 9a-2:30p which was great but I dealt with the guilt of doing “nothing” while they were in school and I didn’t want to spend money either. So I started working with a friend, helping with her business, credit card sales (not my dream job) and I was feeling a bit more fulfilled. Then I received an email from a friend/old coworker and she told me about this opportunity. After some discussion with the Hubs, and the commitment from my mom, I decided to go for it. Since they’ve extended my contract, I’ve been happily growing relationships with adults and learning so much. So that’s where we’re at right now. I’m not sure the boys are in the best school for what works for us but that’s another story and decision for another time. There is no way I can catch everything up that has happened for the last 16 months so we’ll just move forward. Our boys turned three years old. Three years have gone by since those teeny tiny little nuggets entered our world and changed everything. I could cry. As ALL parents say, it really does go by fast. The days of newborns are the longest and the shortest days in the weirdest way possible. After that, it just picks up pace. I never wished to “rush” through any phase (even potty training) because I knew once it was over, that was it. This just doesn’t seem like that long ago to me. My West. He is exactly that, a momma’s boy. The world ends if Daddy attempts to dry Weston off after the bath tub. I use that to my advantage and he hops out of the bath super fast. Weston is a ball of emotion on most days and can swing from being the sweetest, loving, giggly boy to incredibly frustrated and upset with anyone and everyone. He is a lot like me in that sense…every feeling is full of emotion. He looks out for Corbin and loves to introduce them to other people, first saying his name and then pointing out Corbin. At their three year check up, Weston weighed in at 33 lbs and 38.5″ tall. He is slightly above the fiftieth percentile for weight and right at the seventy fifth percentile for height. Weston still naps on occasion and when he does, he naps hard. He sleeps through the night like a champ, rarely getting up and on most days I can hardly get him out of bed in the morning (again, similar to mom). Things I don’t want to forget: Every morning, Weston runs into my arms and tucks his head into my neck so his eyes can get used to the light. When I go to pick him up from school, he grins and squeezes me so tight and says, “I’m so glad you’re here”. When he laughs at his brother, its a full belly laugh if Cor does something silly and the way he says big words like, “incredible and amazing” when we go new places. How Weston always wants to help me with chores. Corbin is still more of a Daddy’s boy. He wakes up early on most days to make sure he sees Daddy before he leaves for work. Daddy always says goodbye but Corbin will look for him half of the morning, asking where he went. Corbin is my snuggle bug though and will lay with me for a few minutes before he fully wake up and always wants to play what I call Marco Mommy with me. If I am in another room he will call, “mommy” and I respond and this continues until he locates me. Corbin is more independent then his brother though and likes to entertain himself, but he also really loves to aggravate Weston. He will take a toy he knows Weston wants and then run away and make Weston chase him. It usually ends with Corbin throwing it behind the couch/table/tub and Weston in tears. I can only image how these “fights” will progress. Corbin weighed in at 30.2 pounds and 38 inches tall. His weight falls just below the fiftieth percentile and his hight was at the seventy fifth. Tall and lean as he has always been. Corbin sleeps through the night about 60% of the time. He sometimes wakes up to go potty or needs reassurance after a bad dream. Sometimes he just comes in to snuggle (to which we send him back to bed). It’s a small prayer every night that he (we) make it through. Things I don’t want to forget: Corbin with his blanket and sucking his thumb (I know). How he will share with his brother and, if Weston is upset, he tries to fix it. Corbin will thank you for doing something for him (like Daddy built the playground for them and a month later, he’s still saying thank you). How he has the goofiest grin when someone tells him to smile for a picture. How much he loves to build parking lots (cars lined up), when he tells me “follow me Mommy” and pulls my hand. How animated and excited he is when he talks about everything. The nuggets are total boys. They love trains trucks, cars, dirt and messes. They’re not so much into bugs…yet. In the love of all trucks, we had a Fire Truck themed birthday party. I found Fire Truck 2 You with Fireman Scott, that brings a real fire truck right to your party. It was so outstanding, I couldn’t recommend a more fun event. I actually attended a community event last night and discovered we are kinda infamous in the neighborhood from this party since the mayor’s daughter in law stopped to inquire about it. Whoa, right? The boys were in love with every aspect, except honking the horn. Corbin did that once and scared more than half the party’s attendants, including himself and that was that. No more honking. But each child had the opportunity to climb in and out of the truck, turn on the lights, push buttons, etc. They had fireman outfits to put on and Fireman Scott even talked about firemen and how they are there to help and not to be scared. It was truly a unique and exciting party for the boys. My next door neighbor (who brought his grand daughter) was my favorite, as he was as interested in participating as the three year olds. I couldn’t recommend Fire Truck 2 You and Scott to more people then I have, i.e., everyone. If you have a kiddo between the ages of three to ten, it is a GREAT party idea. I mom failed on the pictures and relied on everyone else to capture the day. Luckily, I have great friends. So much has happened this summer and I haven’t documented the half of it. The Nuggets can swim. Like, really swim. Put their little faces into the water and swim across the pool to our waiting arms. Take leaping jumps off the edge and swim. This is a major improvement from the initial swim lessons we took last year and earlier this summer. I am absolutely certain that those lessons were important in their success but Suzy’s Swim School in Arlington is in a different league. Ms. Suzy is a elementary school teacher full time but in the summers she works her magic in the pool. In a total of eight, 30 minute lessons the boys became little fish! 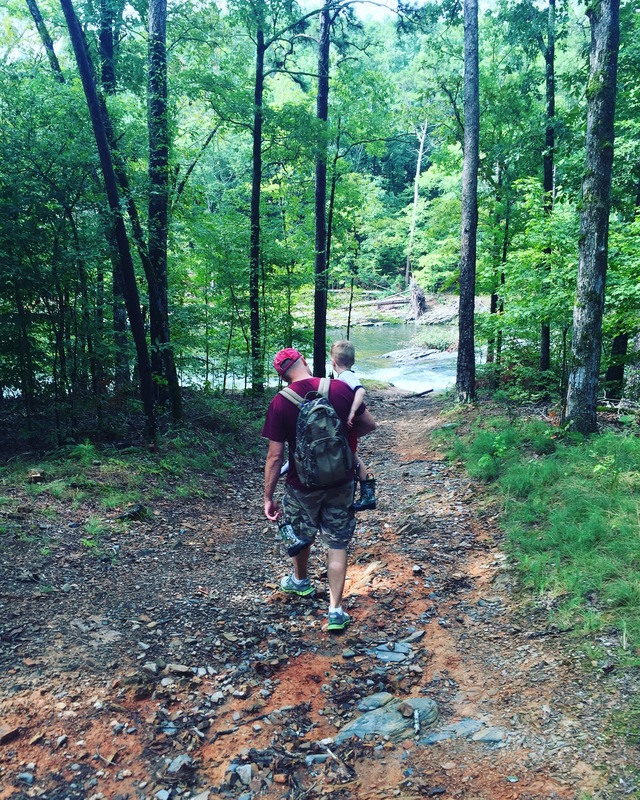 In August, we also took a trip to Broken Bow, OK. I couldn’t live there (this girl doesn’t do country full time) but gosh, I love that place. It’s so stink’n beautiful and it doesn’t hurt that we stay in these gorgeous luxury cabins. We had a small family reunion on The Hubs’ dad’s side. It was the perfect central location for everyone to drive in and the only problem we had was not enough time together. The Hubs and I were also honored when our favorite friends asked us to be their daughter’s godparents. Its a big responsibility for the two of us to ensure we lead her in faith by example. Wrapping up our “last” summer weekend, we felt all kinds of popular because we had three parties to attend on Saturday. Miss Harper turned four years old! Of course all three parties were in vastly different parts of the metroplex but we made it. Thirty minutes late to each party but we attended nevertheless. I assisted in hosting the baby shower and I’m gonna just say it, we’re getting pretty good at this whole hosting-showers-thing. Jenn graciously opened up her always clean, (kid free) beautifully decorated home so we had the best setting. I really enjoy hosting and attending baby showers as I L O V E how our group of friends keeps growing. Life is so good. The boys started pre-school today but I’ll save that for my next post. What, might you ask, did I do with my time while I was free…? Nothing fancy. Just a work out and a little lunch across town with a bestie and furniture shopping. Shopping where I didn’t chase toddlers around begging (and praying) that they don’t break anything. It was heaven. In a world saturated with cameras and pictures E V E R Y W H E R E I still value taking time aside to have a profession take our pictures. I hoped to be that professional but, along with master seamstress and crafty girl extraordinar, I’ve fallen short. Not to say I can’t still accomplish it, it just seems I lack the time (wonder why) to devote becoming really great at any of them. Fortunately, right before the boys were born I came across a picture on a twin mama blog that I about died over. It was sooo precious. Lucky for me, that twin mama is DFW based! What are the odds?! So I sought out the photographer and she’s taken our pictures since. I cannot express how much I appreciate pictures to document this time in life that is flying by but there’s something to be said about “special” time set aside to have your picture taken. Oh how I love these two and what they have done to fill a huge void in our lives.